As I mentioned in a recent post (see here) I have been trying out some W7 products over the last few weeks and one of the products I've been trying is the Flirty Eyes False Lash Effect Mascara. I have really rubbish lashes, they are really short and quite sparse and finding a mascara to make them appear fuller and longer that doesn't cost the earth can be hard work especially because I have hooded eyes so when I wear mascara it rubs on my socket bone and smudges meaning finding a good mascara is hard work, I envy people who can pick any mascara up knowing it will be ok, for me even if I find one I like it can often smudge meaning I can't wear it. I was really excited to try the flirty eyes mascara and see if it would help my rubbish lashes without smudging. I really like the packaging of the mascara with the deep red and black ombre effect, it looks classy and much more expensive than it's £2.99 (was £5.95) price tag. The wand is a rubber/plastic wand with an hour glass shape with short bristles, when I saw the wand I was a little disheartened because I don't get on with hourglass shaped mascara wands, there are some high end mascaras with the same wand that lots of people love and think are amazing but they just don't seem to do anything at all for my lashes apart from coat them so when I saw the shape of the wand I was disheartened. There is an image of the wand shape on the back of the mascara packaging so I knew before I opened it it had an hourglass shaped wand so I was hoping this mascara would be different from others I'd tried previously. 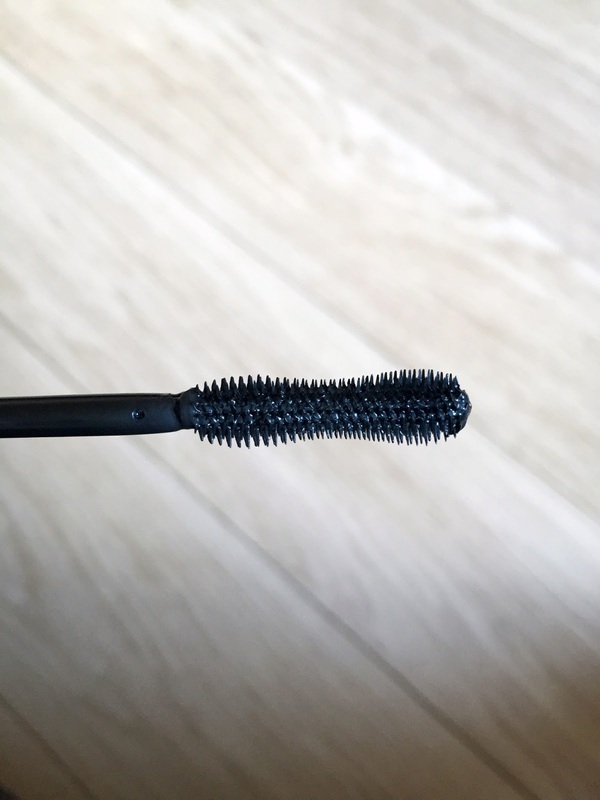 The mascara is a nice consistency it isn't too wet or too dry and the wand doesn't pick up too much product meaning I don't need to wipe lots of product off before I use it. I liked that the bristles on the wand reach into the corners of my eyes and coat all the little hard to reach lashes. I was pleasantly surprised when I used the mascara because it did give me some length and volume and make my lashes look fuller with just one coat and it is a nice black shade, I like mascara to be very black and this one is. As you can see from the photograph my lashes do look longer and fuller and are nicely fanned out and slightly curled and I'm pleased to say the mascara didn't smudge or flake either which is brilliant and as I said I don't get on with hour glass shaped mascara wands at all so to be honest I wasn't expecting the results I got, I thought there wouldn't be any difference at all and I would be saying it wasn't great but I was pleasantly surprised and could see a difference and without smudging too so all in all a great result. I wouldn't say my lashes looked like false lashes as the name of the mascara suggests but it is a great mascara and despite having a wand I usually don't get on with, it did give me good results and I could see a big difference and all for under £3 so I was really pleased and think it's a great product. The Flirty Eyes False Lash Effect mascara is available from the Just My Look website HERE for a brilliant price of £2.99 and some even better news is that Just My Look offer free UK delivery and same day dispatch on all UK orders which is incredible for such an affordable product. The Just My Look website is brilliant and has a wide range of brands and products all at affordable prices and as I said free UK delivery with same day dispatch too, it's a fantastic site with some brilliant products and I highly recommend checking it out, they have a great range of W7 products HERE or if you want to browse the website for other brands and products just click onto THIS LINK. I have some more W7 product reviews coming soon plus some dupe posts, so if you like W7 or want to find out more about the brand, look out for those posts.